You are currently browsing the Suburban Homesteading – Frugal Living blog archives for April, 2009. How Long Can You Go Without Spending? Living a homesteading life is about living simply and carefully, managing the resources your family has. And that includes your cash. In these tough times everyone is watching how they spend their money and what they spend it on. But, have you ever challenged yourself to see if you can keep the money that’s in your wallet – in your wallet? It might be interesting to see how long you can make a $20 bill last. 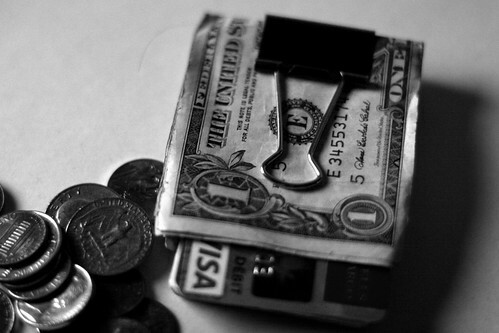 So, here’s the challenge – during the course of a week or a day, remove all the credit cards and cash from your wallet, except for one $20 bill. The limited amount of cash will encourage you to think about which of your usual expenses are essential and which ones are just nice to have. Think about some of your usual non-essential purchases, such as lunch, a newspaper, a coffee or a car wash. Through the course of the challenge, think about the non-essential purchases you make and identify ways to supplement them, so you don’t feel you are depriving yourself. If you normally buy lunch, pack a lunch from home. You’ll be surprised how much money this will save you. Do you buy a newspaper or a magazine throughout the day? Switch to on-line news sources or bring a book to read instead. Better yet, bring a book about a homesteading skill you’d like improve on or learn. If an afternoon coffee is your crutch, bring your own supplies from home and make your java at work. Remember – you can enjoy your lunch or coffee along with the book, outside in the fresh air where you can clear your head and shake off the stresses of the day. If you’re use to having your car washed every week, try using an inexpensive “Wash Only” car wash. You know – the kind where you stay in your car while it’s being washed. The inside cleaning can be done at home for free. Or, put yourself on a once a month car wash schedule then move towards a “when-ever-it-needs-it” plan. The goal of the challenge is to see how thrifty you can be, how far you can stretch your money, identify areas of non-essential spending and most important of all SAVE YOUR CASH. There are so many great websites with mounds of homesteading information on the internet, but there are also some awesome magazines as well. Some are commonly found on newsstands, in bookstores or at local public libraries while others take some digging to find. Whether you have a country or suburban homestead, the magazines below cover all areas of homesteading and would be wonderful additions to any home library. 1. 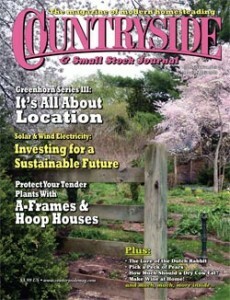 Countryside & Small Stock Journal – is brimming with hands-on information about building, energy, recycling, livestock, gardening and a host of other homestead related topics. This well established magazine is completely reader written with many small articles and tidbits. You won’t find articles written by researchers with no application experience or about university tests. The authors have real hands-on experience in what they’re writing about. 3. Hobby Farm Home® – is the home magazine for those truly living the country life. But, like Hobby Farms, this magazine is also well suited for those striving for a more self-sufficient life because it highlights farmhouse activities such as cooking, crafting, collecting, pet care and home arts and skills. If you’ve decided to take control of your life in these uncertain economic times, you’re not alone. Thousands of families are taking control of their lives by turning their “home” into a “homestead”. And, in doing so, they’ve found a level of personal security in being less vulnerable. Now Patrick Wojtowicz, 36, his wife Melissa, 37, and daughter Gabrielle, 15, raise pigs and chickens for food on 40 acres near Alma, Mich. They’re planning a garden and installing a wood furnace. They disconnected the satellite TV and radio, ditched their dishwasher and a big truck and started buying clothes at resale shops. Read more about one family’s venture into a more self-sufficient lifestyle. 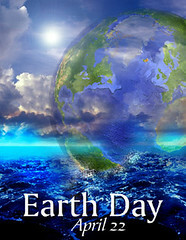 Cities all over the world will be celebrating Earth Day 2009 throughout the month of April. Although each city celebrates in their own and unique way, most focus a great deal on gardening, self-sufficient living, energy efficiency, composting and the like. Whether you already homestead on your suburban lot or are thinking seriously about starting, Earth Day gatherings are a wonderful place to meet people who are doing the same. 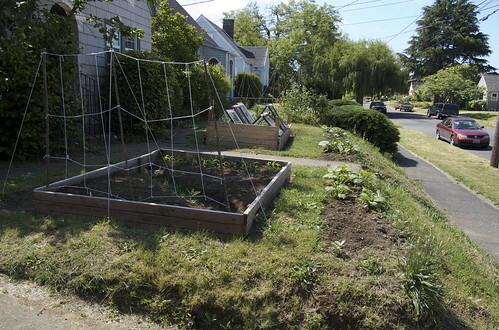 Many celebrations include community garden organizations, gardening clubs, schools, city or county departments, even youth organizations that promote homesteading related topics. All of which can be wonderful resources for new and seasoned homesteaders alike. Strike up conversations with vendors and community organizations and build your network of knowledgeable people who can help you on your path to a more self-sufficient homesteading life. Gather information about meetings, workshops, seminars and classes where you can learn about homesteading topics you’re interested in. But, most of all, watch and listen as people you’ve never met talk freely about how they got started, what they do now, their trials and challenges, and how it has changed their life. Use their stories and experiences as inspiration to start your own adventure. Check out local information to find dates and times of celebrations near you. If your town or city doesn’t hold an event, don’t be shy, go to another city. The goal is to not only educate yourself, but find people you can ask for help or advice. A word of caution though – the celebrations I’ve attended are teaming with freebies and sale items. From useful tools to free plants you’ll be loaded down by the end of the day, so go prepared with totes and rolling baskets to carry your bootie home. If your Earth Day also includes free compost go prepared with a shovel and buckets, barrels or trash cans to bring home your share of that Black Gold. 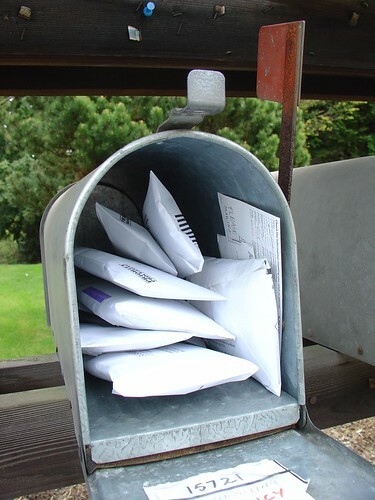 Are you bombarded every day by the never ending pile of junk mail that arrives in your mailbox? Is it a challenge to manage the stacks that accumulate all over the house? Well, you’re not alone. The average consumer receives 41 pounds of junk mail each year, according to 41Pounds.net, an organization that removes your name and address from dozens of organizations for a small fee. But, we like the companies that allow you to opt out for FREE! Go to www.optoutprescreen.com to have your name removed from the mailing lists used by the three major credit bureaus. It takes just a few minutes, and should reduce the number of credit card and insurance offers you receive. To cancel catalogs you no longer wish to receive visit www.catalogchoice.org. In the meantime don’t forget to destroy the mailing label and recycle the unwanted junk mail! One of the goals of any homestead is to ultimately provide homegrown fruits, vegetables, meat and dairy. And a “suburban homestead” is no different. But, we all have to eat while the homestead “gets off the ground”. Along with that, we should always be prepared to survive what ever natural disasters frequent the area of the country we live in. One way to do this is with long-term food storage. Now, more than ever, the topic of food storage is being discussed from coffee houses to corner offices. The more information we hear about the depth of our economic challenges, the length of time it will take to fully recover and the predictions about food shortages, the more families are turning to storing food. With all the information swirling around the actual process of figuring out what to store, how much to store, where to store it and what to store it in can be quite daunting. The websites below give great information about the entire process. The University of Utah website gives a concise easy to understand overview of the need and process of food storage; while the food calculator you’ll find here is a great tool to figure out “how much” of each food item your family should store. 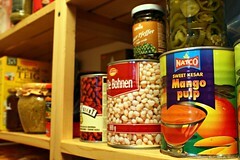 Food Storage Made Easy is a fun website that can address all your questions about food storage. It also has a lot of great examples and photos of what a food storage pantry looks like. I haven’t mentioned food storage containers mainly because I prefer the more frugal approach of getting food grade buckets from donut shops or deli. If that’s not your style, you can Google food storage containers, there are lots of choices. The best way to make it through any disaster, whether natural or man-made is to be prepared. But, remember this is a process that can be done over time; adding storage items to your weekly or monthly shopping. Or, whenever you find great sales on the foods your family enjoys. It doesn’t have to be done all at once.